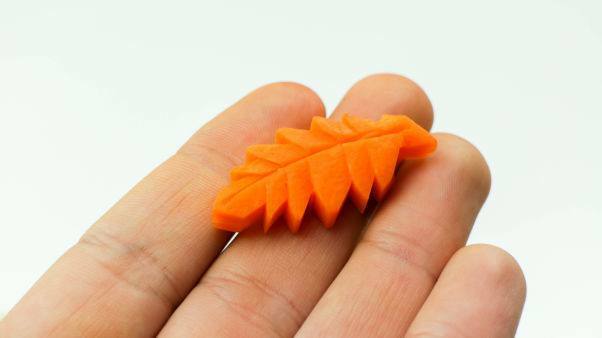 Create this stunning 3-D carved carrot leaf to garnish your sushi, jazz up a salad, or turn up the volume on a simple plate of steak and chips! There’s no need to have boring old boiled carrots ever again! Begin by cutting a 5cm (2”) piece from your carrot. Now turn the carrot piece on it’s end and cut a block 1cm (2/5”) thick, create a nice smooth edge by ensuring that at least one edge of your block does not go through the core of the carrot. Lay the block on it’s side and with a small paring knife, cut a goldfish shape into the block. Don’t worry about the wastage, you can always use the leftover pieces in a soup or a sauce like this one “Carrot Ginger Sauce Recipe“. Create a vein in the centre of your leaf by making a curved cut from one end of the leaf to the other. Holding the knife at a 45° angle, make a second cut following the line of the first cut to make the vein look 3-D.
On the side of the leaf, starting from the wider end (near the goldfish tail), press your knife in at a straight angle to make a small cut. Do not go all the way to the vein. Make a second cut at a 45° angle to the first, cutting in to join the first cut. Remove the small piece of excess carrot. Make another cut at a straight angle, where the 2nd cut starts. Then move your knife along and make another cut at a 45° angle to that one. Continue with this pattern until you’ve made zig-zags along the entire leaf. Repeat on the other edge of the leaf. Lay your leaf down on the chopping board. Using a small knife, join the top end of your zig-zags with the central vein of the leaf. Holding the knife at a 40° angle, make a very precise cut from the vein of the leaf to the tip of the zig-zag cutting a small slice of carrot out. Continue until you have carved out all of the slices where your cuts join the vein of the leaf. This gives a 3-D effect to the top of the leaf. At this point, you can repeat Steps 3-5 on the other side of your carrot if you would like to have a carrot that is carved on both sides. These look particularly great tossed in salads! Additionally, repeat Steps 1-5 to create as many carrot leaves as you need. Once you have all of your carrots cut out, it’s a good idea to lightly cook them to make them more tender and add a little bit of flavour. If I am garnishing sushi or any other seafood dish I cook my carrots in Dashi stock, but alternatively you could use chicken stock or even a light beef stock depending on what you are making. November 5, 2014 Salmon "Sake"
September 12, 2013 Salmon "Sake", Tuna "Maguro"